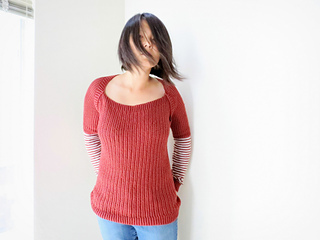 8 sizes available, 31 (34, 36, 40, 42, 46, 50, 53), sizes are based on chest measurements of finished sweater in inches. 0-3 inches / 0-7.5 cm positive ease recommended, sample is shown with 2”/ 5 cm positive ease. 24 sts x 32 rows = 4” x 4” / 10 cm x 10 cm in 1 x1 ribbing pattern of k1-tbl, p1-tbl. 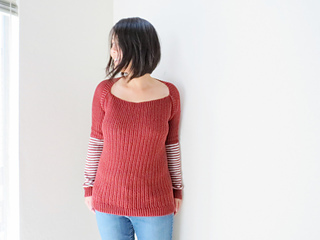 It is very important for this pattern to measure your swatch after blocking. 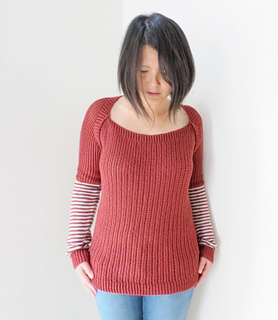 Let the swatch of ribbing stretch out naturally without pulling. 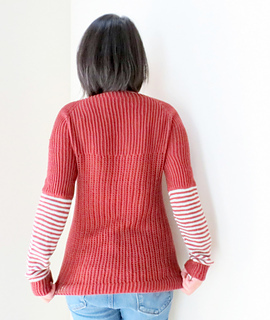 Sweater is worked from top down with raglan style sleeves. Joining Front to Back and Sleeves at underarm. Body and Sleeves are then worked in round.